On Wednesday and Saturday evenings in the summer, take a dramatic, 90-minute night-time cruise and get a glittering view of Chicago's iconic skyscrapers. 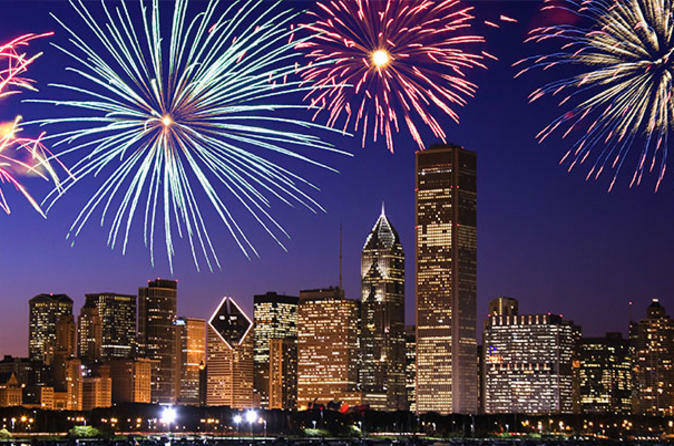 Your evening ends with an up-close view of Navy Pier's spectacular fireworks display from either Lake Michigan or the mouth of the Chicago River. Make your way to either Navy Pier or Michigan Avenue for your cruise departure. Board your river boat and find a comfortable seat; a restroom and sometimes a full bar are available on the boat. The tour begins when your guide, an architecture expert, gives you an introduction to the city's landmarks. Along your scenic 90 minute cruise, see buildings by world-famous architects including Mies van der Rohe, Helmut Jahn and Skidmore, Owings and Merrill. A boat on the river is the best vantage point to admire the distinct city skyline and the fireworks display. Pass by more than 40 distinctive buildings, including the the Aon Center, the John Hancock Center, the Willis Tower (formerly known as the Sears Tower) the Wrigley Building and the IBM Building. Listen as your guide recounts the two major events that helped shape the architectural history of the city. Learn about how the invention of balloon-frame construction revolutionized how homes were built, and hear the dramatic story of Chicago's rise from the Great Fire of 1871. Both of these milestones led Chicago to become one of the cradles of modern American architecture. Your cruise concludes with a fantastic view of the Navy Pier fireworks display. Please see the Itinerary section below for a full list of buildings on the tour.